Or: How I made it to the top of a Munro, only not to see very much. After the aborted attempts on Thursday and Friday I took a break on Saturday, where I went to Pollok House and the People's Palace. The weather forecast for today looked quite promising, so I drove to Inveruglas and left for Ben Vane. Quite a few other people had the same idea and were walking on the road to Loch Sloy, from where there was a quite nice view of Ben Vane. 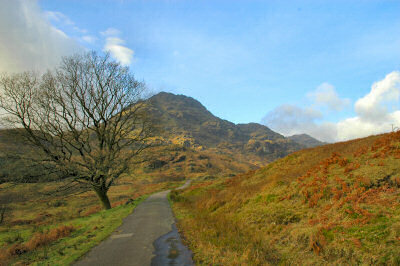 After a while I reached the foot of Ben Vane and left the road. The going was quite tough, with the ground being boggy in a lot of place. The path lead upwards almost constantly, there aren't too many flat parts allowing you to catch you breath. Some excitement was provided by a SAR helicopter exercising over A' Chrois and in Coire Grogain. It dropped off people in various places and even landed on the summit of A' Chrois. Unfortunately the weather turned worse now and more and more clouds moved in the higher I got. I decided to continue to the summit, hoping that the clouds might break up again once I arrived. 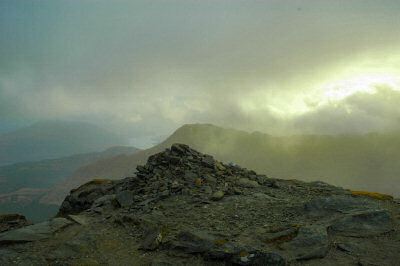 It was still quite cloudy and visibility was low when I arrived at the summit. Some breaks appeared in the clouds and I was able to see Ben Ime for a few minutes, Ben Vorlich remained hidden behind clouds the whole time though. Still, it was a very nice walk and a good day out. Tomorrow it's time for some shopping and then driving back to Swindon.